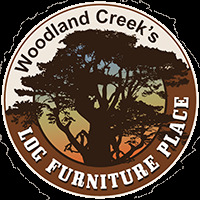 Our Hawk Creek Collection is made from circle cut Alder wood that goes through a multi-step process to give each piece of furniture an exquisite finish. Handcrafted with loving care, the Hawk Creek Collection is built to last for generations to come! The Hawk Creek Rustic Alder Entertainment Armoire features pocket doors above as well as two lower drawers and doors. This rustic alder armoire will not only serve as a functional piece of furniture to hide away your TV, components, as well as CD's, DVDs, and video games, it will also look amazing in your great room! The circle cut lumber lends a Western style to this armoire, yet the simple lines and hardware remind us of the Mission/Craftsman era. Whatever this rustic alder wood armoire reminds you of, it will last for generations and look great with many different decorating styles. Enjoy this beautiful rustic armoire in your rustic retreat at your lodge, log cabin or western ranch home. Made from circle cut Alder wood.